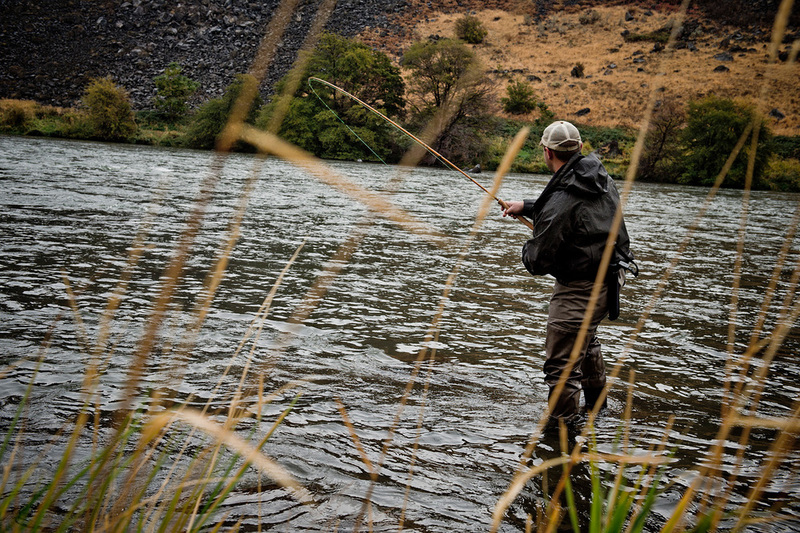 In Oregon, Summer and Fall is lower Deschutes River season. The season of floating lines and feisty steelhead, early mornings and late nights in the desert canyon. 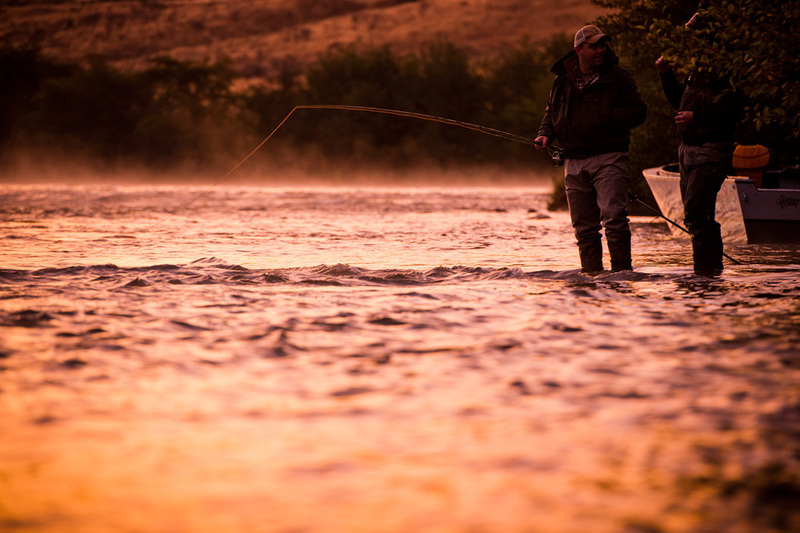 There is nothing like standing in the gold-colored evening flows of the Deschutes watching the light fade, anticipating the heavy weight of an angry steelhead on the end of your line. The lower Deschutes River is a wonder of the West and could very well be the greatest summer steelhead fishery on the planet. 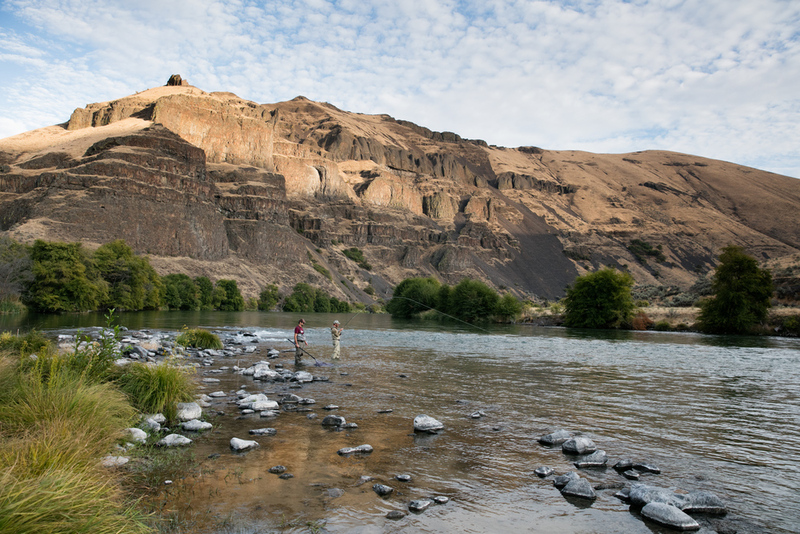 From June through November, chrome-bright Summer steelhead enter the river, some returning home, others just taking a detour out of the mighty Columbia on their upstream journey. The fish in the Deschutes are incredibly aggressive to the swung fly making it one of your best chances at catching steelhead on a floating line. 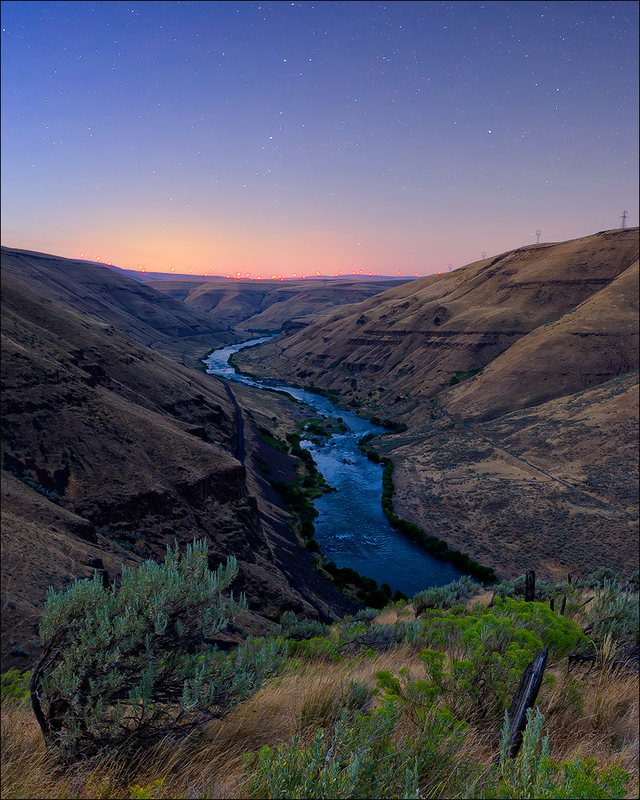 The Deschutes begins high in the Southern Cascade Mountains of Central Oregon, flowing north, the river drains the eastern side of the Oregon Cascade Mountains until it meets the Columbia River just east of The Dalles. The unique geography of the river keeps abundant cool water at steady flows through all of the Summer and Fall. This oxygen rich water attracts many stray steelhead out of the Columbia River on their way upstream to countless tributaries. We concentrate our energy on the lower section of the river, maximizing our chances to encounter not only fish that are fresher from the salt, but also large B-Run steelhead bound for Idaho. The lower 24 miles of river from the mouth up to Macks Canyon is road-less and therefore the best access is by boat. ...THIS IS OUR SIGNATURE TRIP!!! With jet boats, we run our guests from the mouth up to camp mid afternoon on the first day. From there we access countless runs, pools and out of the ordinary known steelhead holds. The jet boat gives us the best fishing access and flexibility on the water. We can stay in the shade longer for fishing floating lines and even skated dry flies. We can also fish each spot in the order we want to fish them, some spots fish better in the mornings others fish better in the afternoon. We have the ability to keep you fishing in spots that have a more favorable wind direction for your casting. Not to mention there is little time wasted between spots, your fly will be in the water fishing longer. Plus jet boat rides through class 3 rapids and whitewater are just plain fun. Our jet boat camps can accommodate groups of up to 6 guests using two jet boats. Single or double angler? No problem we have folks to join you to round out a fun group. Standard length trip is three nights though custom lengths are available. We concentrate our fishing at first light and last light and take a break/siesta hour after lunch. Our gourmet chef prepares all the food for us. All you need to do is relax and fish. We will have you back at the boat ramp at 1pm on the last day. Prefer the quiet solitude of peacefully floating down river? 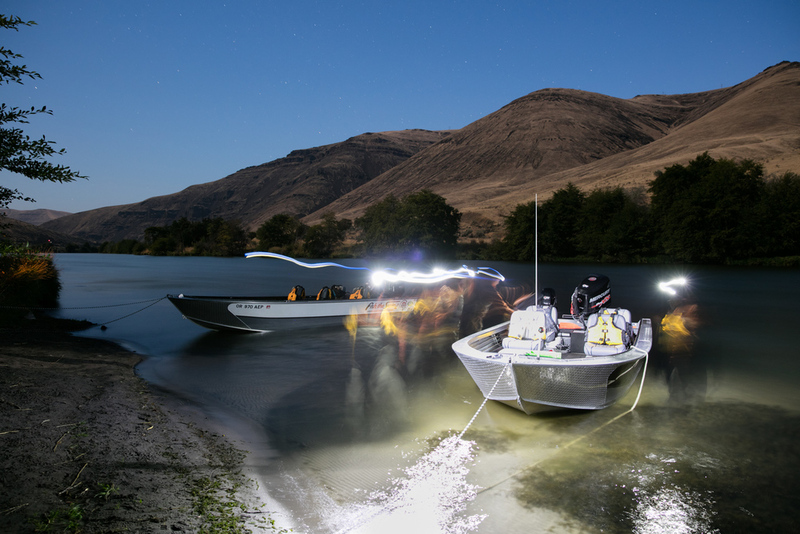 We offer overnight camp trips using drift boats to access the best steelhead water on our way to camp which is set up before you arrive by our crew. This 24 mile long float gives you the full experience of the lower canyon wilderness. Our float trips begin at Mack's Canyon mid afternoon on the first day. Days mid-trip start before dawn and are full days fishing, usually moving to the next camp location down river each day. That is unless you're thick in the fish, we don't leave fish to find fish. Mornings start in the camp water followed by a quick breakfast. 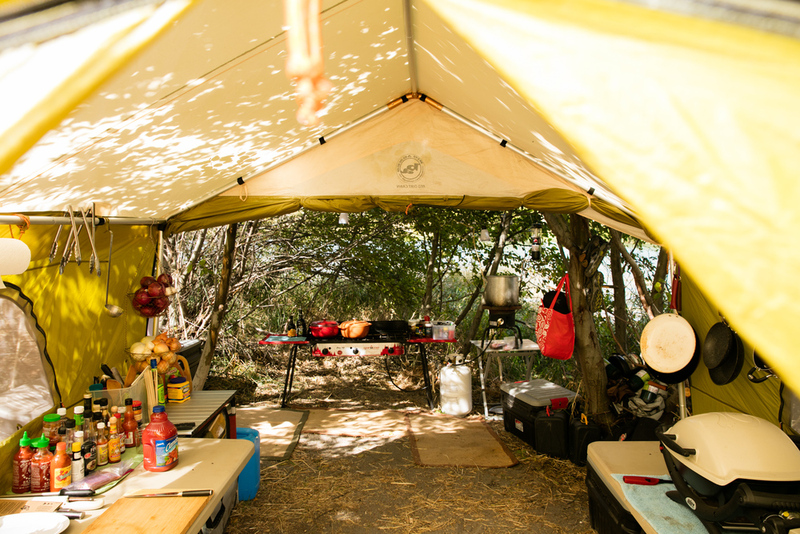 Your guide will have your lunch in the boat each day and dinner will be ready for you when you arrive at camp in the evening. On the last day we will float you out to the river's mouth at noon where our vehicles have been shuttled. Our float trip camps can accommodate groups of 2 to 6 guests using one to three drift boats, and a gear raft. Standard length trip is three nights though custom length trips are available. We concentrate our fishing at first light and last light and take down time to relax in the shade after lunch. Our camp host sets and breaks camp each day and prepares all the food for us. All you need to do is relax and fish. Prefer to get off the river at night and sleep in a bed or maybe you only have one day to go fishing. 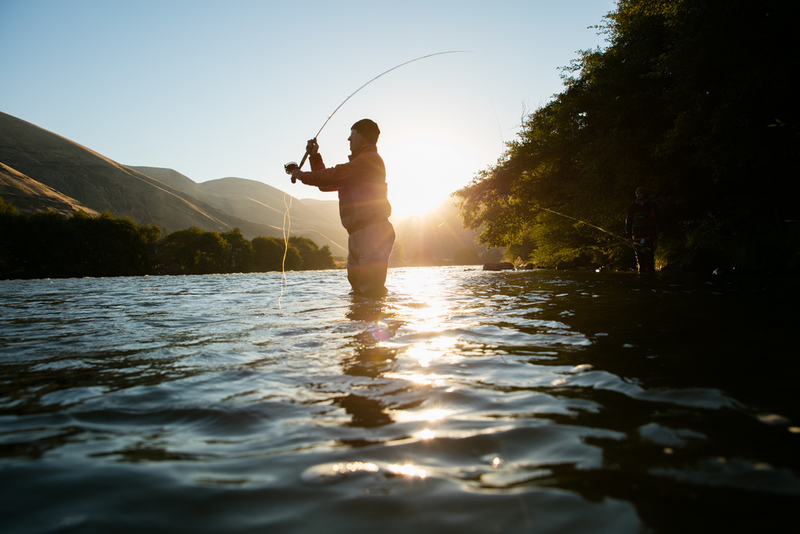 Our day trips start at first light at the mouth of the Deschutes at Heritage Landing and end at Heritage landing after a full days fishing. These trips have easy access to stay the night in The Dalles or Hood River. We maximize the morning fishing in the shade with floating lines. We will fish our way upstream into the canyon, typically taking you 10 to 15 miles up into the roadless canyon. Most days, when the sun comes on the water we switch to sink tips. We fish only the best spots in the order we would like to fish them. We grill and serve a hot lunch on the river. In the afternoon shade we will switch back to floating lines and often times dry flies. At the end of the day, the thrilling jet boat ride back downstream is worth the trip alone. Day trips are 8-10 hours of guided fishing. Our Deschutes River day floats concentrate further upstream in the Maupin section of the river. In this zone we have several different options for day floats to give you the best odds at catching fish while having the best experience possible. Float trip day trips start before first light at a meeting point agreed upon with your guide. These trips have easy access to stay the night in Maupin. We maximize the morning fishing in the shade with floating lines. We will fish our way downstream through the canyon. Most days, when the sun comes on the water we switch to sink tips. We fish only the best spots that best suit your abilities. We grill and serve a hot lunches on the river. In the afternoon shade we will switch back to floating lines and often times dry flies. Day trips are 8-10 hours of guided fishing. Fish The Swing is the exclusive booking agent for all Deschutes River trips. ALL TRIPS ARE RuN BY DESCHUTES STEELHEAD ADVENTURES LLC which is owned by JEFF HICKMAN AND RICK SABOL. 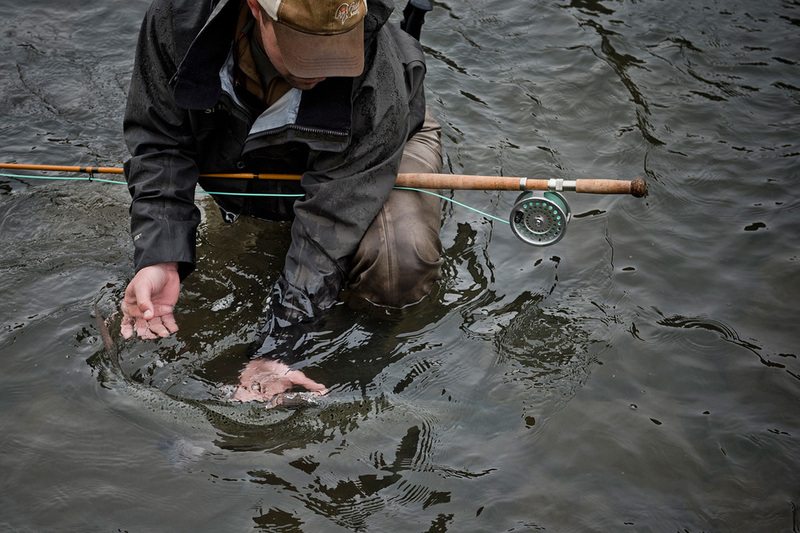 Deschutes Steelhead Adventures does not have its own website. ALL DESCHUTES RIVER TRIPS REQUIRE A SPECIAL BOATERS PASS FOR EACH PERSON AND FOR EACH DAY OF THE TRIP. Including enough TO COVER the STAFF. ONE ADDITIONAL BOATER FOR DAY TRIPS, TWO ADDITIONAL BOATERS FOR DRIFT BOAT CAMPS, three ADDITIONAL BOATERS FOR JET BOAT CAMP TRIPS. The Dean River is the ultimate destination for any anadromous fly fisher. 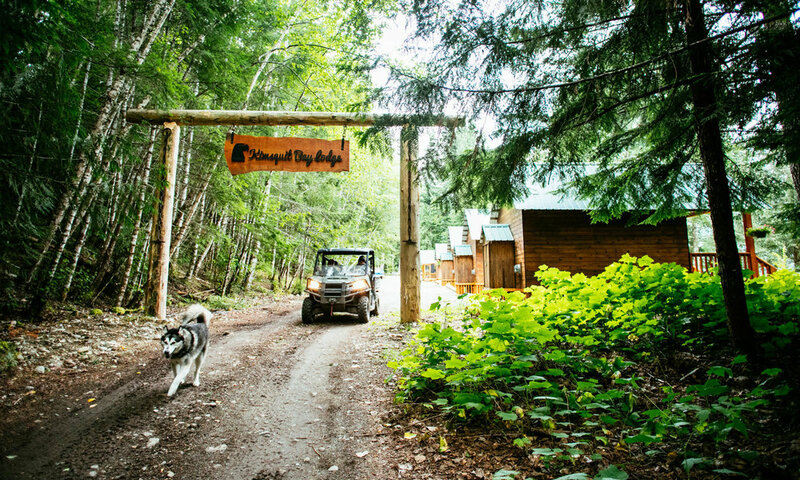 And for good reason with the world's hottest, freshest salmon and steelhead in a wilderness setting, the Dean offers visitors unrivaled natural beauty. 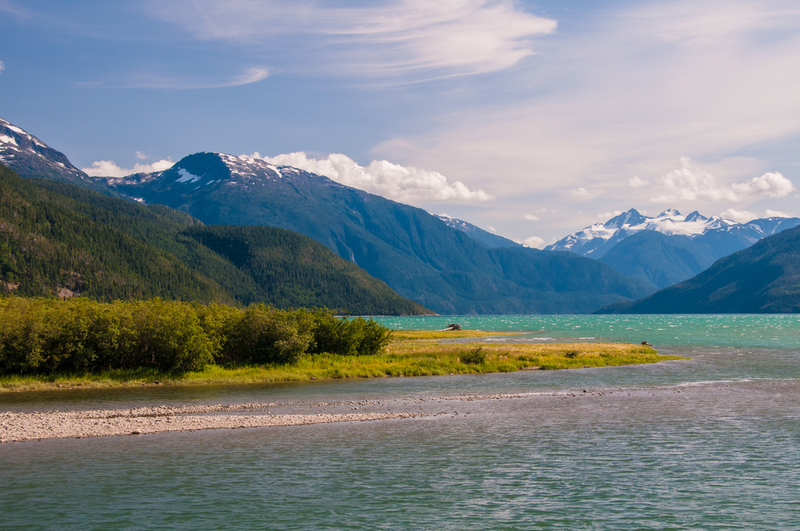 Our lodge sits nestled in the trees, perched above the turquoise waters of Kimsquit Bay. Sweeping views of glaciated, snow-capped mountains rising high above the salt chuck Dean Channel and Grantham Falls are our nearest neighbors. 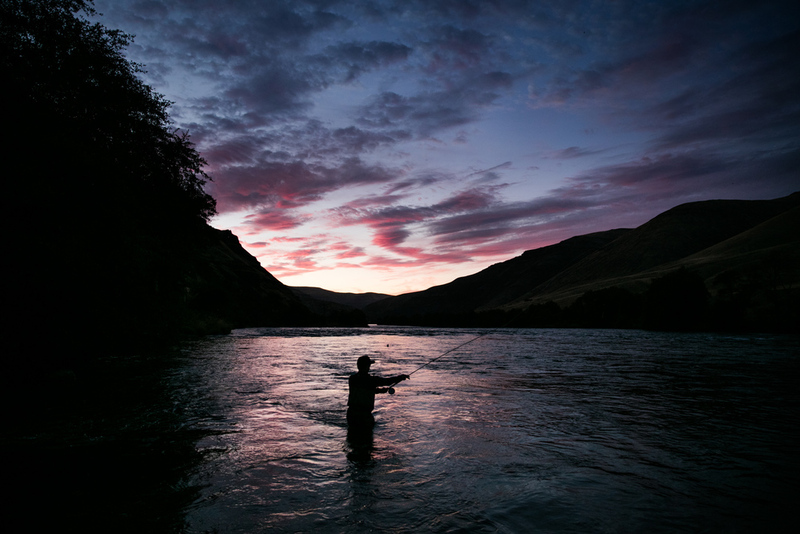 We are perfectly positioned to target the river's silver-bright fish in their most impressive condition: close to the sea, in the lower river, and below the turbid white water of the Dean Canyon.